Note: This review is based on the Sundazed CD edition, which includes bonus tracks that were not on the original U.S. version of Dear Eloise/King Midas In Reverse. Additionally, the British version of this album, which was titled Butterfly, had different tracks. Apologies for any confusion that might ensue. The finale of a trio of pop masterpieces released by The Hollies from 1966 through 1967, Dear Eloise/King Midas In Reverse found the band in a particularly adventurous mood. There’s a running theme about escaping the frantic pace of everyday life to find peace and enlightenment, or to just have a giggle at all the “small-minded men with their small-minded wives.” Once again, there were some fully orchestrated tracks, this time arranged and directed by Johnny Scott, but there were also some straight-up pop songs. 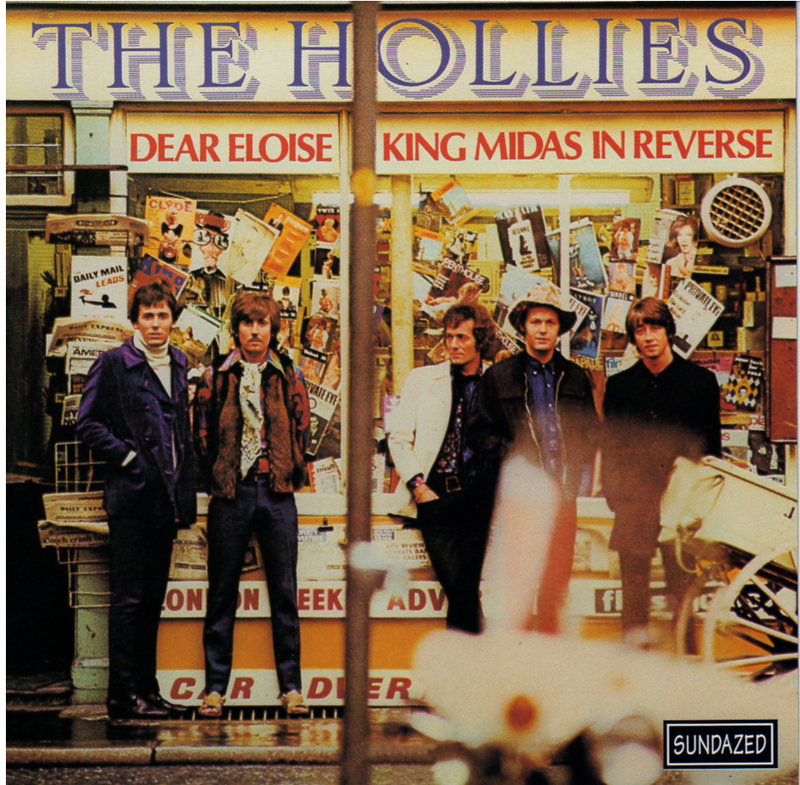 “Dear Eloise” bridged the gap between The Hollies’ new experimental approach and the tried and true, by incorporating more complex lyrics and electronically altered vocals within a catchy pop arrangement. Graham Nash’s “King Midas In Reverse” wandered further afield, with a slightly disturbing sentiment (“I’ll break you and destroy you” ) and ambitious instrumentation. Its disappointing performance on the charts (particularly in America) would cause friction between Nash and his band mates. Interestingly, the current lineup of The Hollies still performs it in concert. Some of the other orchestrated tracks, such as “Away Away Away,” “Wishyouawish,” and “Pegasus,” were much more lighthearted. Allan Clarke’s massive and brooding “Would You Believe” was a monument to unrequited love, and he would later scale it down on his solo release, Headroom. Nash’s picturesque “Butterfly,” which was the title track on the UK version, serves as The Hollies’ most delicate love song, outside of the rarity, “Wings.” The exotic “Maker, ” with its sitar and tablas, and the psychedelic “Elevated Observations” both preach reaching a higher consciousness. Within this context, the old-fashioned wisdom of “Do The Best You Can” seems kind of simple, although once again Tony Hicks’ banjo playing is entertaining. “Leave Me,” as previously mentioned in my review of the UK version of Evolution, found The Hollies successfully exploring garage rock, while “Step Inside” is an infectious invitation to a woman to drop by for tea and crumpets. And other things. The breezy “Post Card” sports some of Nash’s quickest rhymes as well as a fascination with exotic locales that would surface later on “Marrakesh Express” (originally intended for The Hollies) and “Lady Of The Island” from Crosby Stills and Nash’s debut album.